Even though we constantly hear about our colleagues and friends who may suffer from eating disorders, do we actually process the profound affect such behavior has on an individual and our society as a whole? With the slogan, “I Had No Idea,” NationalEatingDisorders.org is raising awareness for eating disorders from Feb. 23 to March 1. UW-Whitewater’s campus has been and will continue to participate in National Eating Disorder Awareness Week with full force. University Health & Counseling Services has set up several events including the “I AM Enough” selfie campgain, workshops on Art & Media and Media & Body Image and a presentation by UHCS’ own Gwen Hering. UHCS challenged students and staff members to take selfies holding a message that reads why and how they are “enough”. These images were then uploaded directly to the UHCS Facebook page. Examples of messages include “I am strong enough,” “I am pretty enough,” etc. Booths were also set up in the University Center on Feb. 17 and 18 for students to drop by and have their pictures taken. 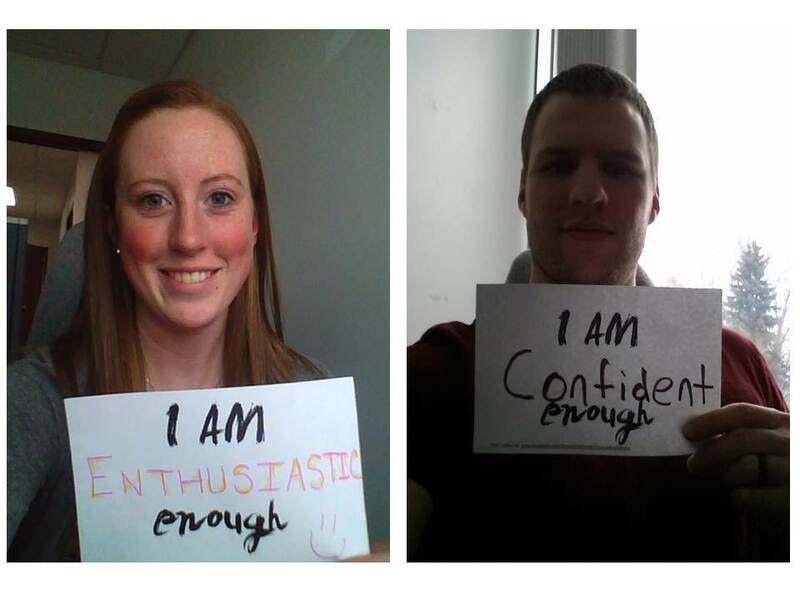 All selfies will be displayed on the “I AM Enough” wall throughout NEDAW. This workshop aims to “train the trainer” of young girls. It will take place at noon on Feb. 25 on the Fern Young Terrace. Artist, activist and co-founder of Project Girl, Kelly Parks Snider will lead participants through a cultural landscape that investigates how advertisements and media affect young girls today. The goal of the workshop is to learn how to proactively engage young girls in conversation and teach them how to employ media literacy skills. Gwen Hering, a counselor for UHCS, will speak about her own journey of recovery from an eating disorder at 7 p.m. on Feb. 25 in Hyland Hall 2101. The presentation will be followed by a “Q & A” with a panel of experts from UHCS. At 6 p.m. on Feb. 26 on the Fern Young Terrace, UHCS will sponsor a workshop that targets students interested in creating “a symbolic piece of art” while learning about the impact media has on peoples’ self esteem. The workshop will also be led by Snider. Students who participate will create a piece of artwork using images from popular magazines. Visit this link for more information about NEDAW and the events UHCS is holding. Heading into this week of awareness, please remember the struggles people go through every day and keep reminding yourself that you ARE ENOUGH! Juicing and Blending have both become extremely popular in the past few years. People are always on the lookout for ways to eat healthy and quickly, so it is so surprise that these two methods are trending. The question on everyone’s mind is, which one is better? Some people insist on juicing their fruits and veggies, while others are passionate about blending. After looking further into the topic, you’ll be pleased to know that BOTH may be beneficial to your health! Juicing is the fastest way to get nutrients into your body. When you juice fruits and vegetables it gives you a direct intake of nutrients that your body needs to maintain a healthy lifestyle. Also, by juicing you can drink a lot more fruits and veggies in one sitting verses with a smoothie. A component to look out for when juicing is to make sure you are mixing fruits with vegetables, otherwise your blood sugar levels could drastically spike. Blending on the other hand releases the nutrients into your body at a much slower pace. The benefits of blending fruits and vegetables come from fiber. Since you are using the whole fruit the fiber does not get separated, but is broken down so that you body can easily digest it. Blending will also keep you fuller longer because of the density of the drink verses juicing. With both juicing and blending, you want to make sure that you drink right away. If you wait a while you will be losing a lot of nutrients because of light and air destroying them. So whichever path you choose to take, I hope that this clears up some questions about the differences in juicing verses blending. Both sides have plenty of benefits, and by giving your body fruits and veggies it is already happy! This has been a cold, dark, long winter and considering the groundhog didn’t see his shadow, we have many more weeks to go. All I think about is swimming in a pool and being outside, and then I remember that I have to wait awhile yet for that. Then I heard about the Freezin’ for a Reason Polar Plunge. Swimming in 90° weather sounds a lot more appealing than jumping into a freezing cold pool when it is expected to be in the low 20’s, but I’ll take what I can get. A pool is a pool right? I can’t be picky. Every year participants take the plunge into the ice-cold water, whether it is a pool, ocean, lake, or river, to show their support for the Special Olympics. When talking to some of the jumpers from last year, many replied with “Raising money for the Special Olympics in order to jump into a freezing cold pool is like a winter tradition.” It is so exciting to see everyone be supportive and brave. The event is schedule for February 15, 2014, and the jumper’s take the dive throughout the morning and early afternoon. Warhawk Fitness & Aquatics has created a team of about 17 workers that are brave enough jump and most importantly caring enough to raise enough money for the Special Olympics. Each jumper needs to raise a minimum of $75, and with the help of EVERYONE (yes you reading this blog) we hope to reach our team goal and raise grand total of $1,300.00. Stop by Room 100 of the Williams Center, and they will gladly take your donation. Do you workout at the Weight Room, University Fitness, Group Fitness classes, or maybe take advantage of the Williams Center pool? All those locations you can donate your money to the supervisor and they will put it in the designated envelope. Don’t like to carry cash? Are you from out of town? You can donate online! Choose one of the listed jumpers to donate to at the Warhawk Fitness and Aquatics Donation Site! All proceeds benefit the Special Olympics directly and our team needs your help to reach our goal so we can all be Freezin’ for a Reason! If you have any questions, don’t hesitate to email me at weidmankl15@uww.edu. I am so excited for this event; I would love to discuss anything you have questions about! When I first heard of the group fitness classes that are offered here at Whitewater, to be honest, I didn’t really think too much of them. I thought that they were only for people who aren’t really in shape and just needed a group to motivate them. Boy was I wrong. The one class that I found surprisingly difficult was yoga. I have taken a yoga class a few times now, and I was sore in places I didn’t know I could be the next day; however, I am not only am I sore, but I am most surprisingly relaxed. The class is about an hour long, with roughly 45 working minutes and 15 resting minutes at the end called a ‘savasana’. The class is very well taught by individuals who are chosen and trained by Warhawk Fitness staff. I give a lot of credit to the individuals who teach these classes! I can tell it takes a ton of strength, endurance and concentration to teach the classes! I came into the class also thinking that I was somewhat flexible…after all, I could touch my toes. Once again, I was wrong. There were poses that I was shaking while trying to hold! Thankfully I wasn’t the only one! The amount of core that you use during this class is also unreal. You do so much balancing that it is an ab workout within itself. Now I don’t want to intimidate you at all, because these classes are ‘challenge by choice’—you can stop at any point to take a break if they are too challenging. You don’t have to push yourself as hard as the instructors or other people taking the class either, and no one looks at you any differently. It is a very accepting and motivating environment. AND, it is not only for girls! I truly cannot say enough good things about group fitness classes here at Whitewater. We have an amazing program this it utilized pretty heavily already. There are classes for everyone. If something sounds interesting, grab a friend and try it out. Don’t be nervous either, everyone is very welcoming and helpful. You can push yourself at your own rate, and the classes are appropriate for every fitness level. Oh, and make sure to show up a little early, because most of the classes fill up pretty quick! Here is a link to the schedule of classes!